Wooden floors are often a solid flooring choice for your home or business, as not only are they timeless in their aesthetic appeal but they are also hard-wearing, easy to care for if you know how, and ideal for allergy suffers. While wooden floors do have their advantages, it is still important to know how to care for them properly. Here we’ll run through some of the common cleaning and maintenance mistakes many people make that can actually ruin and damage your wooden floors permanently. With many different types of flooring, using a large amount of water isn’t an issue. When it comes to wooden floors, however, it is vital that it’s only mopped using a very lightly dampened mop. This is because the wood absorbs water, and thus will cause the floorboards to swell which can lead to cracking in the finish. Using a mop and bucket that allows you to wring out the mop head as much as possible is highly recommended. A very common home remedy people use to clean their hardwood floors is vinegar. The thought process behind this is that some say the vinegar cleans the dirt away without damaging the wood. In actual fact, the vinegar is acidic and will eat away at the shine of your floors, giving it a blotchy appearance over time. And ammonia will have the same effect on hardwood floors as vinegar does, so avoid using these cleaners on your wooden floors. The problem with using wax on a wooden floor is that it will actually attract more dirt to the floor, making it more difficult to clean. By adding another layer of wax over the original layer, it will only work to secure that dirt that will sit between the layers and within the top layer of wax. Similarly, using an oil soap will only work to attract more dirt and will also make the floor far more slippery, causing a potential safety hazard. Doing much the same as wax and oil, silicone should also be avoided as it will not absorb into the wood and rather sit on the surface, causing the appearance of splotches. Steam mops should be avoided, as they not only use water to clean the floor but the excess heat they use can work to break down the protective layer on the floor’s surface over time. To bypass the bucket, some people will pour a cleaning solution for wooden floors directly onto its surface. While this doesn’t seem like it would be harmful, it is. This is because excess liquid of any kind can absorb into the wooden surface and cause it to swell over time. The problem with wooden furniture polish sprays is that they are essentially just wax, so they will have the same effect and are not recommended for use on wooden floors. Not all mops are suitable for use on wooden floors. Some mops will easily scratch and cause damage to the floor. Only use a mop that is specifically designed for use on wooden floors. 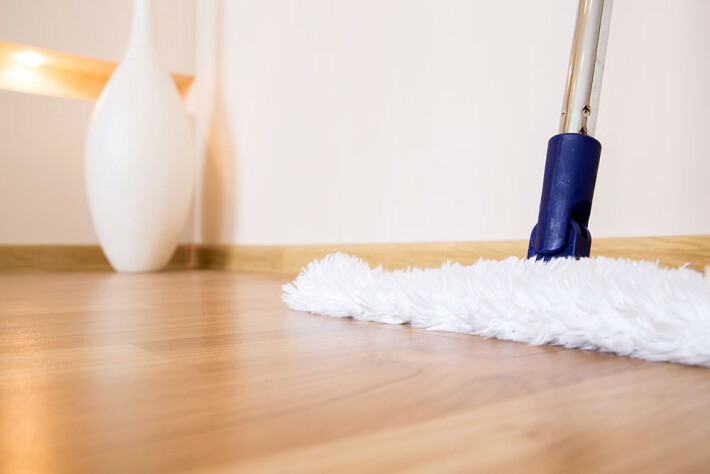 A dirty mop not only defeats the purpose of cleaning in the first place, but it can also scratch the floor with the dirt and debris picked up from the last clean. Always mop wooden floors with a dirt-free, clean mop. Vacuuming wooden floors without the proper attachment will cause severe scratches in seconds. Ensure the correct head is on the vacuum before attempting to clean. The purpose of using a floor buffer on a linoleum surface is to polish and remove wax at the same time. If a floor buffer is used on a urethane-varnished hardwood floor, the buffer will scratch and eventually remove the finish all together. Hardwood floor cleaning machines are basically floor buffers. They are used to polish waxed floors. While old hardwood floors were waxed, making them ideal for maintaining the look of waxed floorboards, today wooden floors are coated with a urethane varnish. Using an old hardwood floor cleaning machine on today’s modern wooden floors would therefore simply scratch the finish and add wax to the surface, causing the floor to be sticky and therefore trap more dirt. It’s easy to maintain your wooden floorboards as long as you know what to do, and what to avoid. By cleaning and caring for your wooden floor properly and with high quality cleaning equipment, you’ll be able to enjoy the timeless elegance wooden flooring has to offer for many years to come.